Moscow: Russian President Vladimir Putin took a dip in the icy waters to celebrate the Orthodox Epiphany, which commemorates the baptism of Jesus Christ, Kremlin press service said. The press service did not specify exactly where Putin took a dip, saying only that Putin was in the Moscow region. Earlier, Presidential spokesman Dmitry Peskov said that Putin had been celebrating Orthodox Epiphany by participating in the ice-hole bathing event for a number of years. The ritual dunks in the icy waters take place overnight to January 19 on one of major Orthodox Christian holidays, the Epiphany. 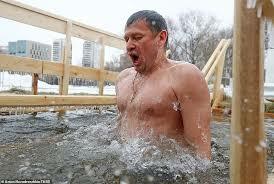 However, ice swimming is a folk custom rather than a religious ritual. Epiphany bathing commemorates the baptism of Jesus Christ in the Jordan River. In 2007, during his visit to Jordan, the Russian president washed his hands in the Jordan River and visited the sacred site where Jesus Christ was baptized by St. John the Baptist. While visiting Jordan in 2012, Putin participated in the opening ceremony of the Russian Pilgrim House, located near the place where Christ was baptized.